Not an ability you get to use unless you have so many Zoog in the deck that you are drawing them regularly. And including lots of questionable cards just to make another work is not good imo. I know draw = win, but not like this. Here's that Zoog enabler that nobody wanted. If the effects on Zoog cards were worth slotting into a deck, then this card would be amazing. Unfortunately, they're not. What could be better than a card that gives both repeatable resource acceleration and card advantage? Any card without zoog in the name apparently. Combos well with the new agency conspiracy that requires both players do discard a card to resource and their other resource denial. 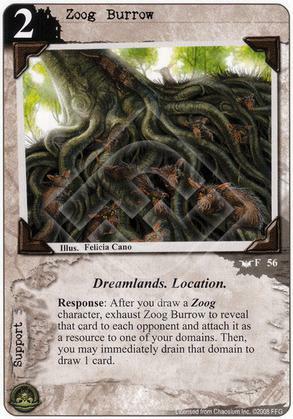 Agency can also put zoogs from the discard on top of the deck to reliably trigger the burrow. There's also additional agency synergy between zoogs and attack dogs, but let's not go there.